Global oceans are known to have alternated between aragonite and calcite seas. These oscillations reflect changes in the Mg/Ca ratio of seawater, which control biomineralisation and the composition of marine carbonates and are thought to be caused by the time dependence of crustal accretion at mid-ocean ridge crests and associated high temperature mid-ocean ridge brine flux. Here we use global ocean basin reconstructions to demonstrate that these fluctuations are instead caused by the gradual growth and destruction of mid-ocean ridges and their relatively cool flanks during long-term tectonic cycles thus linking ocean chemistry to off-ridge low temperature hydrothermal flux. 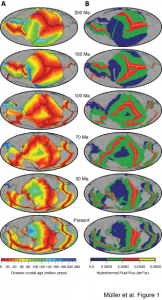 Early Jurassic aragonite seas were a consequence of supercontinent stability and minima in mid-ocean ridge length and basalt alteration. The break-up of Pangaea led to a gradual doubling in ridge length and a 50% increase in hydrothermal flux mainly through an enormous increase in ridge flank area, leading to enhanced alteration of basalt, lowered seawater Mg/Ca ratios and marine hypercalcification from 140 to 35 Ma. A return to aragonite seas was driven by pronounced continent dispersal, leading to progressive subduction of ridges and their flanks along the Pacific rim.